In the haunting tradition of In Cold Blood and The Executioner’s Song, this remarkably insightful and surprisingly intimate portrait of Saddam Hussein lifts away the top layer of a dictator’s evil and finds complexity beneath as it invites us to take a journey with twelve young American soldiers in the summer of 2006. Trained to aggressively confront the enemy in combat, the men learn, shortly after being deployed to Iraq, that fate has assigned them a different role. It becomes their job to guard the country’s notorious leader in the months leading to his execution. 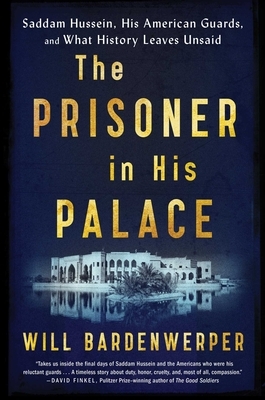 Living alongside, and caring for, their “high value detainee” in a former palace dubbed The Rock and regularly transporting him to his raucous trial, many of the men begin questioning some of their most basic assumptions—about the judicial process, Saddam’s character, and the morality of modern war. Although the young soldiers’ increasingly intimate conversations with the once-feared dictator never lead them to doubt his responsibility for unspeakable crimes, the men do discover surprising new layers to his psyche that run counter to the media’s portrayal of him. In this artfully constructed narrative, Saddam, the “man without a conscience,” gets many of those around him to examine theirs. Wonderfully thought-provoking, The Prisoner in His Palace reveals what it is like to discover in one’s ruthless enemy a man, and then deliver him to the gallows. "An Iraq war veteran himself (but not in the Super Twelve), Bardenwerper has written an exceptional debut . . . his storytelling skills—confident but never showy prose, a terrific sense of pacing—make for an enlightening piece of journalism." "Bardenwerper gives the reader a close look at a real-life supervillain, and how easy it is for him to gather minions at his feet . . . tightly-constructed and engaging."